Beatrice is an out-of-the box thinker who does her best thinking when she is hanging upside down. She has planned a secret mission, Operation Upside, with her best friend, Lenny. On the first day of third grade, clad in her ninja suit, Beatrice is ready to put her plan into action, but Lenny has a new friend and is less than enthusiastic about Operation Upside. Beatrice, it seems, will go to any lengths to keep her friend and carry out her mission. There are many qualities to love about Beatrice. She is determined, but also unique, imaginative, and humorous. Although Beatrice's actions are sometimes frowned upon, especially by her teacher, her intentions stem from kindness. Beatrice remains true to herself even when others aren't accepting of her uniqueness. There is both humor and warmth in this book. Beatrice is a fun character who finds herself in a predicament that will amuse young readers. 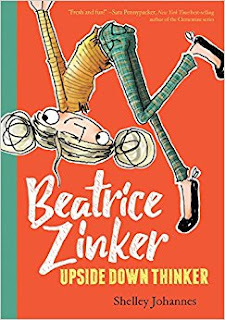 Beatrice can also show young readers something about kindness, friendship, and accepting others in spite of their differences. Anyone who has ever felt a little different will be able to relate to Beatrice. The illustrations, mostly black and white with a splash of color, are charming. This is a great book to recommend to those who enjoyed books such as Dory Fantasmagory, Piper Green and the Fairy Tree, and Hazy Bloom and the Tomorrow Power. Thank you to the author, Shelley Johannes, for sharing an advanced reader copy of this book with my #bookexcursion group. She also shared a lovely illustration of Beatrice.